Anyone who presents something other than pantomime at Christmas is to be congratulated. Naff village hall versions aside, I’ve never been a fan of panto, particularly in their revoltingly commercial guise. But shows at Christmas for the whole family – that’s a different matter. If you ever saw Treasure Island at the sadly closed Mermaid Theatre or The Lion, the Witch and the Wardrobe by the RSC, you’ll know that a great family show is a winner. And a winner really is the best way to describe the Brewhouse in Taunton’s production of The Wind in the Willows, which takes Kenneth Graeme’s novel of the River Thames and transports it to the Somerset levels (just a stone’s throw from Taunton), the home of the willows to this day. Accompanied by a wonderfully inventive jazz score, this play with songs – it’s never quite a musical – steams along (a model train is one the greatest moments of the show) in just over an hour and fifty minutes. But it’s the four animal leads who so stand out. Mole – bumbling and half-blind, a gentle soul with a charming innocence and kindness about him; Ratty – debonair and suave, a gentleman of sorts; Badger – apparently played by Barry from Bridgewater, an audience member, but actually conveying a suitable sense of gravitas; and, of course, Toad. 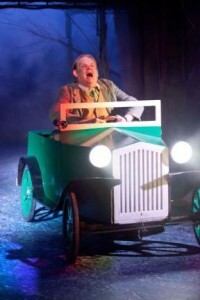 Toad (Fred Broom) really is the star of the piece, a fantastic bundle of energy, impeccable comedy. tom-foolery, arrogance, silliness and childish remorse. Written by an in-house team, the script is true to Graeme’s plot and keeps a wonderful feel good factor, but it also cleverly weaves in a number of references to the real world; Graeme’s story might well be about aristocrats and comfortable country dwellers, yet there is a more political tone somewhere – the threat of the weasels and stoats broods away menacingly until under the assured wisdom and strength of Badger, order is restored and evil defeated. A simple set of willow and wood suggests everything from the river bank where Mole first meets Toad to the court where poor old Toad meets his doom; this might not be West End big budget stuff and there might well have been one or two technical glitches – the sound balance was not quite right – but what it lacks in money, it more than makes up for with imagination. I wasn’t a fan of the children’s dancing, nor was I taken by some of the ‘localised’ humour, but each to their own; I’m sure many of the audience loved such charming twists. Unusually, this production ended with a charity appeal from Toad. Whilst I’ve been asked to cough up plenty of times at the theatre – usually for a very worthy cause – this time we were asked to contribute to the Brewhouse’s own coffers; Somerset County Council has withdrawn all funding for the venue. Cough up I did – as Toad reminded the audience, it was through local and regional theatres such as this that many actors (himself included) and big names in directing, writing and producing got their first break. More importantly, perhaps, it’s the social glue such venues offer – a chance for those a long way from London to experience the sheer pleasure such nights at the theatre offer.